Steel structure designs mentioned above are produced by using Tekla Software. Our design is created in 3D format. After the 3D design finishes, Tekla Software automatically generates workshop drawings including the bill for required material. 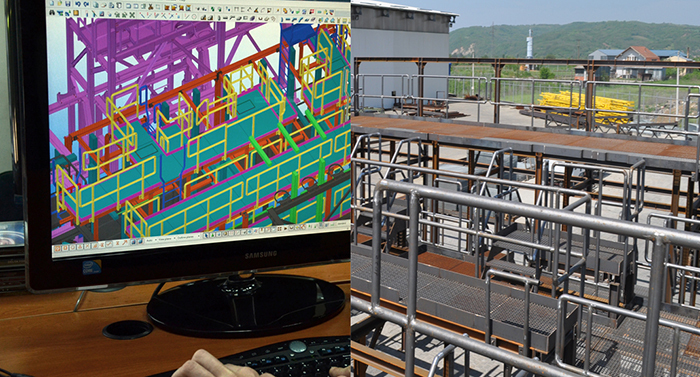 Our engineers are skilled in different TEKLA applications, from small and simple projects to big complex delivery. We builded an extensive TEKLA library incorporating the latest industry standards (DIN,ASCM, BS, GOST, ASIAN STANDARDS). We employ 15 highly trained TEKLA engineers. The other major offering that we provide is civil design. Our civil design includes the technical documentation mentioned above. It is composed of multiple connected projects (see items above). Each piece of project is being developed using the software specially made for corresponding industry. Afterwards, all project pieces are combined in one project plan representing the overall view of the project. We use static testing methodology to ensure that our steel construction and civil structures are completed according to the best latest standards. To achieve that, we carefully consider which material is best to use. In that way, we achieve the highest quality and exceed the expectations of the customer. For this purpose we use STAAD software. Finally, we give high priority to esthetics of the overall project. Our highly trained professionals work with our customers on every custom needs including reviewing or changing the project. Hipra’s engineering and Static team works in a way to reach the all given requirements with a competitive prices.